So using the vanilla cupcake batter that I made, I put spoonfuls into some tiny silicone star shaped cake cases that I have. I had to just judge the timing for these as they were quite small – so I started with 10 minutes and that was long enough for them to be cooked. Once cooled, I tipped them out of the cases and had to slice off the dome top that rose up during the cooking so that I could lay them flat on a plate to serve. I used a black food pen to draw on some eyes and turn ordinary stars into Starman! 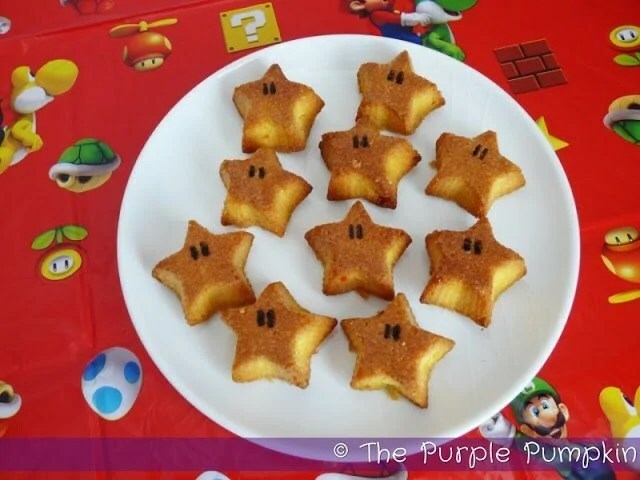 Starman Cupcakes – Nintendo Party	Food for a Nintendo Themed Birthday Party!